This post-card from Paine’s Stationers, on the corner of Washington Street and Davis Avenue has a chronology of historical facts about Brookline, Massachusetts. The timeline runs from the area’s initial settlement in 1630 to a much more urban 1936. A lot of that convoluted terminology has to do with the events on this list. But, as noted, the area didn’t last as part of Boston as both grew. 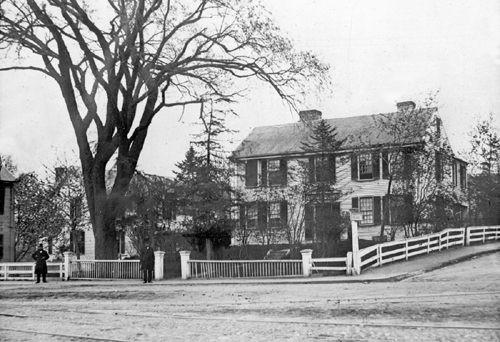 Brookline became one of the first so-called ‘streetcar suburbs‘ connected straight to downtown Boston by municipal rail (1847). You can pick your academic theory on what this separation meant — either evidence of municipal imperialism according to historian Ken Jackson, or municipal fragmentation as Boston became one of the first cities to stop annexing outlying areas. Think New York City without Brooklyn, for an imperfect analogy. This entry was posted in Brookline, Ephemeral Boston, Images and tagged Brookline, Crabgrass Frontier, Davis Avenue, Ken Jackson, Muddy River, streetcar suburb, Then&Now, Washington Street. Bookmark the permalink.